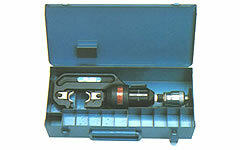 CN-58H Hydraulic Compression Tools: Izumi Products. The CN-58H was designed to accept both Burndy MD6 W insert dies and Kearney/Blackburn O type/OD58 insert dies. C framed head allows side loading of connectors and will accommodate conductors upto 24mm outer diameter. Saddle dies are Kearney/Blackburn D insert or Burndy MD6 D3 fixed. These dies can be changed to other Kearney/Blackburn dies. If Burndy W dies are used, simply slip the Burndy W dies over the saddle dies D3. 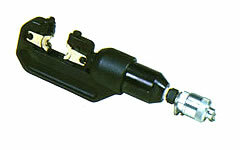 This tool requires an external 700 bar hydraulic pump.